Coconut flesh, also known as coconut meat, is the solid white part of the coconut's interior. 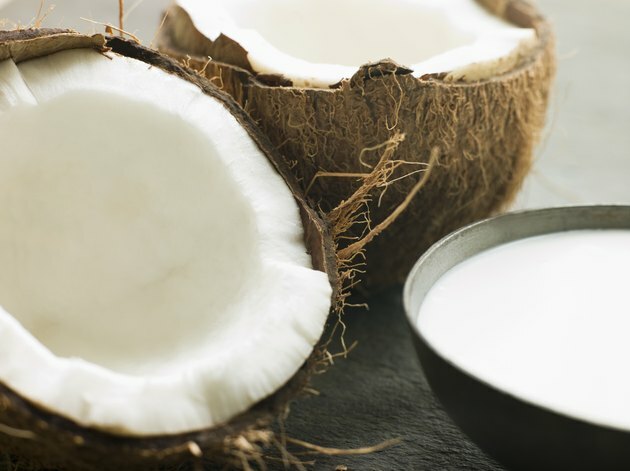 Other edible parts of the coconut include the coconut milk liquid, which is surrounded by a layer of flesh, or coconut water which is extracted from the milk. Like any food, there are nutritional advantages and disadvantages to eating coconut flesh. It is possible to be allergic to coconut products. Consult your doctor before making significant dietary changes. The USDA standard nutrient database provides data for raw coconut meat. A cup of shredded coconut flesh weighs 80 grams and contains 283 calories, 2.7 grams of protein, 26.8 grams of fat, 12.2 grams of carbohydrates, 7.2 grams of dietary fiber and 5 grams of sugars. One medium-sized coconut has approximately 400 grams of flesh, so a cup-sized serving represents roughly one-fifth of a coconut. Coconut flesh is a dense source of energy, and is low in sodium. The essential minerals calcium, iron, phosphorous, magnesium and potassium are all present in coconut flesh. Small quantities of vitamin C are present in coconut flesh. Coconut flesh provides a small quantity of protein, which is acceptable to vegetarians and vegans as a non-animal foodstuff. Coconut flesh is naturally quite sweet to the taste, and can be substituted for refined sugar as a dessert topping or sweetener. A major nutritional disadvantage of coconut flesh is its high saturated fat content. Of the 26.8 grams of fat present in an 80-gram cup of raw coconut flesh, 23.8 grams is saturated fat. Saturated fat is more dangerous to your health than unsaturated fat. Mostly found in animal-derived foodstuffs, saturated fat can raise your cholesterol levels, increasing your risk of cardiovascular disease. High consumption of saturated fat can also increase your risk of developing Type II diabetes. A so-called coconut diet recommends eating coconut oil -- extracted from coconut flesh -- on a daily basis. Proponents of this diet state that coconut oil can boost your metabolism and energy levels, and thereby aid weight loss. However, the high caloric value and fat content of coconut flesh and oil means that it is unlikely to help weight loss. Consumed in moderation, coconut flesh can be part of a balanced diet. Heavy, consistent consumption of coconut flesh is likely to lead to weight gain.